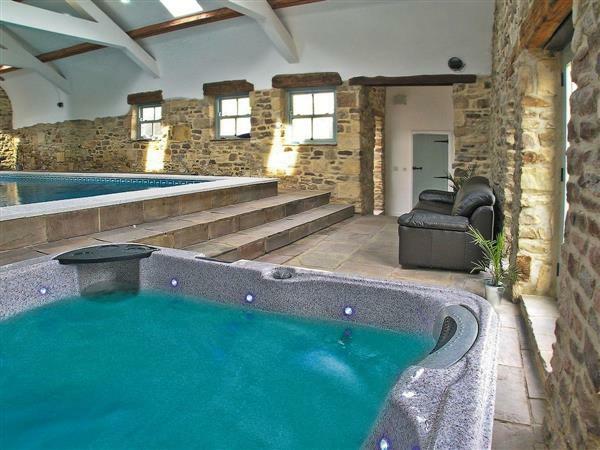 Raby Cottage, Bowlees Holiday Cottages in Wolsingham sleeps 6 people. These delightful semi-detached cottages are holiday homes situated in the heart of beautiful County Durham, located near the idyllic countryside village of Wolsingham, in the Durham Dales. Each cottage offers you the remoteness of a country retreat with shared indoor swimming pool, hot tub and sauna, there is also a games room with full size snooker table. You may pre book 2 one hour sessions per day with the owners prior to arrival. Whether you choose to take in the amazing countryside that County Durham has to offer, or are looking for a quiet retreat, this is the perfect holiday base. Just minutes away are Tunstall Reservoir and Hamsterley Forest, which has bike riding, horse riding and many other activities. Kilhope Lead Mining Centre and Beamish Museum are close by, as is a real snow ski lift. Located approximately half an hour from the historic city of Durham with its world heritage site status, cathedral and castle. The National Railway Museum at Shildon, High Force Waterfall, the Metro Centre, Newcastle Airport, Durham Tees Valley Airport, Diggerland and Newcastle town centre with its cultural attractions are all within easy reach. Ideas for a day trip are Hadrian’s Wall, Lake District National Park and the beautiful north east coastline. Shop, pub and restaurant 2 miles. All properties (refs 27764, 26689 [Bowlees Farm Cottage], 27765 [Durham Cottage], 27766 [Brancepeth Cottage]): Underfloor central heating, electric, bed linen and towels included. Freeview TV. DVD. Electric cooker. Microwave. Washing machine. Dish washer. Fridge/Freezer. Wi-Fi. Shared garden with patio and furniture. Shared natural grounds. Parking (2 cars). Shared indoor heated swimming pool (10m x 5m; depth 2m x 0.9m), with pre-bookable private sessions available twice a day. Shared. Shared sauna. Shared games room with snooker table and games. Welcome pack. No smoking. Holidays run from Friday to Friday. NB: Lake in grounds. Ground floor: Living/dining room/kitchen with stone floor. Separate toilet. First floor: 3 bedrooms: 1 double. 1 twin. 1 single. Bathroom with shower over bath and toilet. Woodburner in living room (initial fuel included). Travel cot and high-chair on request. For a better idea of where Bowlees Farm Cottages - Raby Cottage is, you can see Bowlees Farm Cottages - Raby Cottage on the map below. Do you want to holiday near Bowlees Farm Cottages - Raby Cottage (27764), you can see other cottages within 25 miles of Bowlees Farm Cottages - Raby Cottage; have a look to find your perfect holiday location.